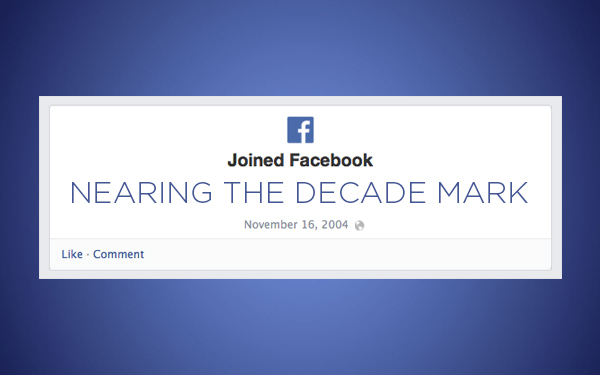 November 16, 2004 – the day I joined Facebook. Nine years later it’s pretty amazing I’m still on the thing, even more so that part of my career can be attributed to it. Facebook has helped me share the excitement of two college graduations, four big moves and nine birthdays (nearly 1/3 of my life). It’s provided a means of communication and comfort through Katrina, my dad’s severe health troubles and the loss of family and friends. In between, it has facilitated thousands of conversations between friends and family near and far. My Facebook experience is just one of the billions as it nears its 10th anniversary in February 2014. Say what you will about the world’s largest social network, it’s been a pretty amazing run. But is the run coming to an end? That seems to be the question on many a marketer’s mind of late, primarily due to a recent study from the Pew Internet and American Life Project. The study found that while overall teen engagement has been stable, the youngest of users are spending less time on the network. It also reveals that the majority of users have at one point or another taken a multiweek break from the service, citing the tedium and irrelevancy of its content. Among users ages 18 to 29, the demographic that first propelled Facebook into prominence, 38% said they expected to spend less time using the site this year. Some are seeing this as the writing on the wall for Facebook, and perhaps it is. The reality is that no one knows for sure. I personally think people are reading a little too much into the numbers and the social network isn’t going anywhere anytime soon. 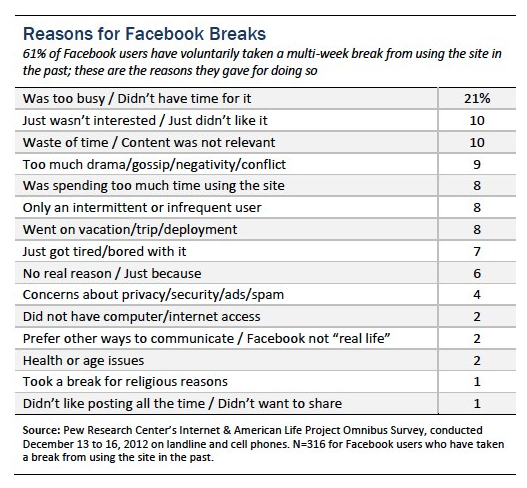 (Nearly 60% of Facebook users say the site is as important to them now as it was a year ago – for those who have left the reasons are widely varied). That being said, it’s ridiculous for anyone to think Facebook will be around for the long term. It’s highly unlikely unless it evolves into a platform for our digital selves of the future. We can look to and compare it to MySpace, Friendster and others but Facebook faces an entirely different set of challenges as it nears the decade mark. We’re evolving. They’re evolving. Erry’body evolving. But seriously, our digital consumption and habits of the future will be instrumental in the future success/failure of Facebook. Facebook was created for college students. It became popular with kids and teens when they could finally get on it. It was cool, hip and totally new territory. But the kids of today have grown up with Facebook. It’s been around their entire life, why would they want to be on it? On top of that, they now have many more options. I’m curious to see what will happen in a few years when their needs change. Successful social networks supplement personal needs. Right now kids and teens see their friends every day, therefore Facebook doesn’t fulfill as many needs. Snapchat, Vine and Instagram do a better job of capturing their moments. I wouldn’t be surprised, however, if the kids and teens of today look to something more “Facebook-like” in a decade, once they want to start sharing bigger thoughts, opinions and news. Whether Facebook will be there or not remains to be seen, but it’ll be something bigger than what they’re currently using. There’s plenty of competition out there and all are worth watching. Even better, they are all worth using, depending on your needs. I personally enjoy all of these networks and still find a use for Facebook. They are not for everyone, each fits a different posting habit and audience. It’s all about using what you like. I think it makes for a good headline or story to constantly pit Facebook against other networks but I still think there’s room for all. Why must there be one massive catchall social network? We see successful fragmenting in every other medium, so why not social networks? What’s it going to take to bring it down? To adequately replace Facebook, something will have to come along that captures and holds the attention of the majority of your social circle. A social network isn’t worth squat if your friends aren’t there. Facebook’s biggest enemy is itself. The user experience is notoriously crummy and frustrating. Everything else is irrelevant unless Facebook can improve its news feed and mobile experience, which needs to happen sooner rather than later. What do you see as the future of Facebook? Are you done with it, considering a move anytime soon or plan to continue using as normal? How have your posting habits changed? I want to hear from you social network users!